Burlington City Council President Jane Knodell eked out an 81-vote victory on Tuesday over independent challenger Genese Grill en route to securing a ninth term on the council. 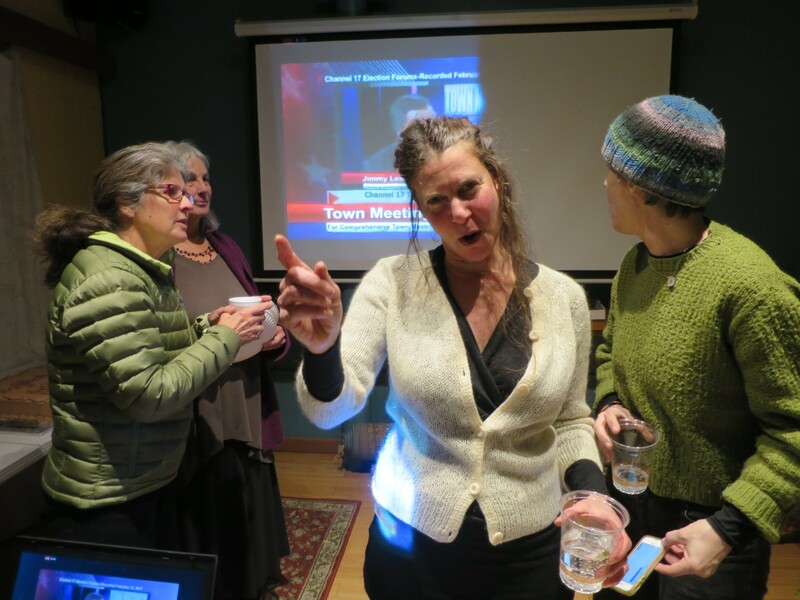 Knodell will retain her Central District seat after a hard fought campaign by Grill, an activist who made her mark during the debate last year surrounding the Burlington Town Center redevelopment. 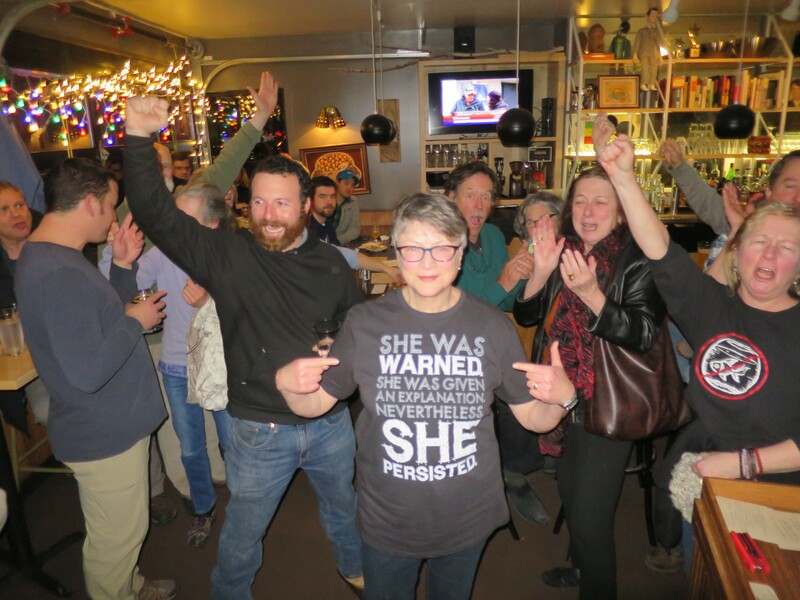 The Progressive Knodell told two dozen well-wishers who celebrated at Butch + Babe's in the Old North End that she had her doubts about the race's outcome. "I think I've lost," she said she confided in fellow councilor Sara Giannoni in the final hours before polls closed. In the end, though, her supporters came through, giving her the victory by a 6-point margin. For the celebration, Knodell donned a T-shirt emblazoned with a quote that referred to Sen. Elizabeth Warren (D-Mass. ): "She was warned, she was given an explanation. Nevertheless, she persisted." "It was a great team effort," Knodell said to cheers. Knodell was one of the three incumbents up for reelection — and all three prevailed. In the South district, Democrat Joan Shannon handily beat the opposition with 66 percent of the vote, fending off Progressive Charles Simpson and independent Abdullah Sall. Dave Hartnett, who ran unopposed, was reelected to his seat in the North District. Hartnett will return to his seat as a Democrat after a two-year stint as an independent. Meanwhile, Richard Deane, a Democrat and political novice, beat out Progressive Charles Winkleman by a 6-point margin. Deane will replace Progressive Selene Colburn, who vacated her seat after winning election in November to the state legislature. At a gathering of Democrats at Nectar's, Burlington Mayor Miro Weinberger lauded the advances the party made Tuesday. "We've got a lot to celebrate tonight," he told the jubilant crowd. With the three victories by Dems, the party will hold six of the council's 12 seats. The rest of the council consists of three Progressives, two independents and one Republican. "We're going to have to work together," said Knodell. Among the challenging issues the council faces is the sale of Burlington Telecom, Knodell noted. But she vowed to run for a third one-year term as city council president, a position that the council will pick in early April. "I think I have the votes," she said. At Grill's gathering at the North End Studios down the street from Butch + Babe's, the assemblage seemed resigned — but not defeated. There was pizza and 12-packs of beer and hugs all around as the results became clear. "This is the most amazing, amazing thing I've ever been a part of and I've been a part of a lot of amazing things," Grill said, standing on a chair to address the gathering of 25 supporters. "I don't want to be a city councilor," she later admitted. "I wanted to show people we could make a change. We did — just not enough." Grill said she doesn't plan to run again, though she does plan to keep fighting for issues she holds dear. "We have no other choice," she said. "There's a lot at stake."